How good of a play is Jaylen Samuels this week in fantasy football? What is The Report? 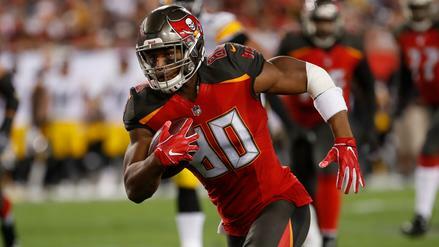 It's a comprehensive, statistical look at how teams and players are functioning offensively, with notes as to what it all means for the fantasy football future. Each week, The Report will feature charts on team play-calling tendencies, player usage close to the end zone, deep ball rates, and so much more. With added commentary, the purpose is to not only hand you information, but provide actionable information to crush both season-long and daily fantasy football. Let's dig into Week 14's report. The Pittsburgh Steelers currently own the highest pass-to-rush ratio in football, throwing the ball nearly two times for every rush. It's no surprise, then, that they've run the ball just 263 times this season, the sixth-fewest in the NFL. 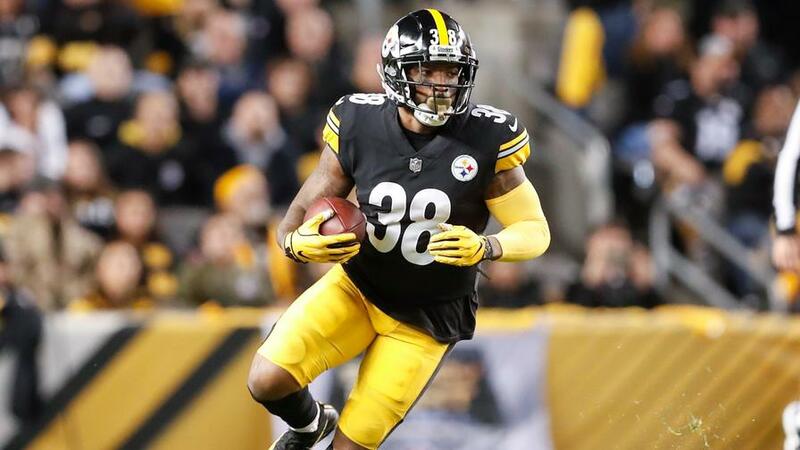 With James Conner sidelined for Week 14, we'll more than likely see somewhat of a split backfield between Jaylen Samuels and Stevan Ridley for Pittsburgh. But considering Pittsburgh's splits, it's easy to side with Samuels, who entered the league as sort of a hybrid player, having played all over the place in college. He's even tight end-eligible in your Yahoo! fantasy league. The real issue is that Ridley could steal goal-line work, capping Samuels' upside. Over the last two weeks, we've seen Buffalo's neutral script pass-to-rush attempt ratio jump by 0.07. That may not seem significant, but heading into Week 12, they were sitting at 0.90, and over the team's last two games, it's been 1.16. Keep in mind, those are the two games where we've seen Josh Allen under center. Maybe they're growing confident in his abilities, or at least allowing him to do more and learn. That's not a bad thing at all for fantasy football. Since Lamar Jackson took over as starter for Baltimore, they've been (predictably) more run-heavy. After Week 10, they had a 1.69 (nice) ratio overall, and a 1.71 pass-to-rush attempt ratio when the game was within six points. Over Jackson's three starts, those numbers are 0.48 and 0.57, respectively. You can see it in the chart -- those two numbers are insanely low. Only the Seahawks and Texans have an overall pass-to-rush ratio south of 1.00 this year, so Baltimore is way under the norm with Lamar Jackson. And that's hurt all pass-catchers on the team in fantasy as a result. As usual, there's not a lot of change within the expected points chart this week. One swap was Baltimore becoming the league's best secondary, and they actually rank as the only team with a negative schedule-adjusted Net Expected Points total within the pass defense category. They'll be in Kansas City this week against numberFire's top-rated passing offense, so it'll make for an awesome matchup. Here's your "Which secondaries should I target with my fantasy quarterback?" update: Look to expose the Atlanta, Oakland, Tampa Bay, Detroit, and (a new one) Carolina secondaries. The chart below displays the raw number of yards and the percentage of yards allowed by pass defense to wide receivers, tight ends, and running backs. Arizona hasn't given up a ton of yards through the air this year, and that includes to wide receivers. They rank ninth-best in yards allowed to the position. 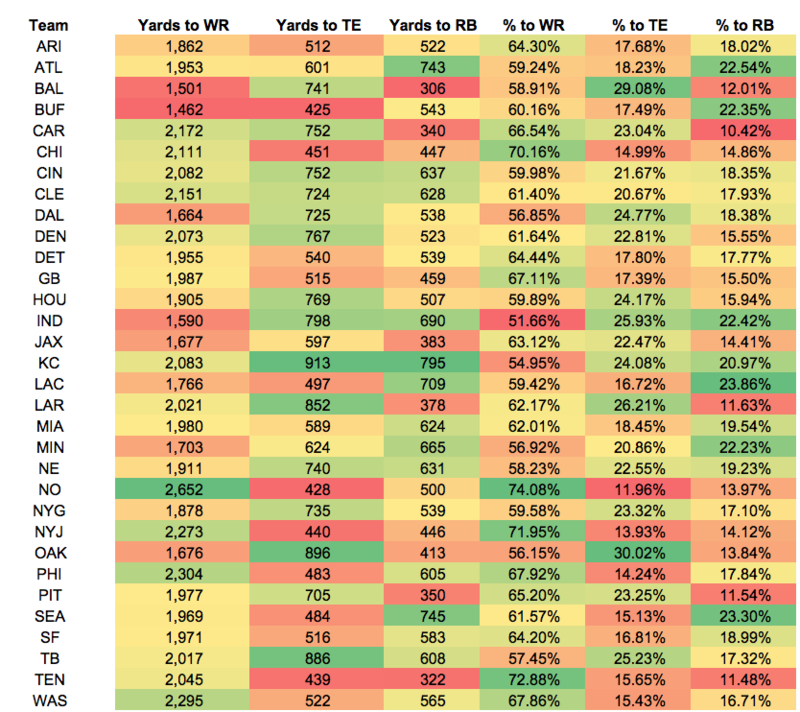 But (and this is the reason for the chart), a hefty 64.3% of their passing yards allowed have gone to wideouts. That's 11th-highest in the league. Detroit wide receivers are still in play this week given they're just two-point favorites, so the game script should be fairly neutral. Looking at the chart, it's obvious that New Orleans struggles against wide receivers. That gives the Buccaneers a plus matchup in Week 14, as no group of wide receivers has produced more receiving yards than Tampa Bay's. And it's not close, either -- they have nearly 400 more yards receiving than the second-place Los Angeles Rams. Considering this game is being played in Tampa Bay this week, you can confidently start Jameis Winston and his wideouts. Larry Fitzgerald is kind of an interesting fantasy option this week. He hasn't been super reliable with just two games of over 50 yards this season, but he's going up against Detroit, a team that's allowed the second-most yards to slot receivers this year, per Pro Football Focus. And with Christian Kirk now on IR, more targets could go Fitz's way. You've got to start Adam Thielen this week, but his matchup against Seattle isn't exactly a fun one. They've only allowed one slot touchdown this year while giving up the second-fewest yards to slot receivers. And as you can see in the chart, they're pretty average against wide receivers in general while surrendering a high percentage of yards to opposing running backs. Again, you can't bench Thielen, but there's some worry that he plays below his norm. The Raiders have given up the second-most receiving yards to tight ends this year, but they've allowed a staggering 30.0% of their passing yards to go to the position. That's the highest rate in football. With the Steelers having a pass-friendly approach this year, this bodes well for Vance McDonald. All numbers below reflect yards per play. I mentioned the Steelers' running back situation at the top, and a reason you should be interested in said situation is because Oakland's been really bad against the run this year. According to numberFire's expected points model, only two teams have allowed a higher Success Rate (the percentage of positive expected point plays) to running backs this season. So it's a great matchup for both Samuels and Ridley. Justin Jackson only played about 22% of Los Angeles' snaps on Sunday, but he was easily the most effective back on the team. Austin Ekeler had just 21 yards on 13 carries, while Jackson went for 63 on 8. We should probably expect an uptick in snaps this week, and considering the Chargers are 14-point favorites, they'll likely see a nice positive game script. That means more potential volume for Jackson against a team that ranks 31st in Success Rate against running backs this year. The Patriots shouldn't have much trouble running on the Dolphins this week. They've been below-average against the run all over the field this year, all while surrendering top-10 numbers to the position in fantasy. Start James White and Sony Michel confidently. Like Mahomes versus the Baltimore secondary, we've got another best-versus-best type matchup with Todd Gurley going up against the Bears. 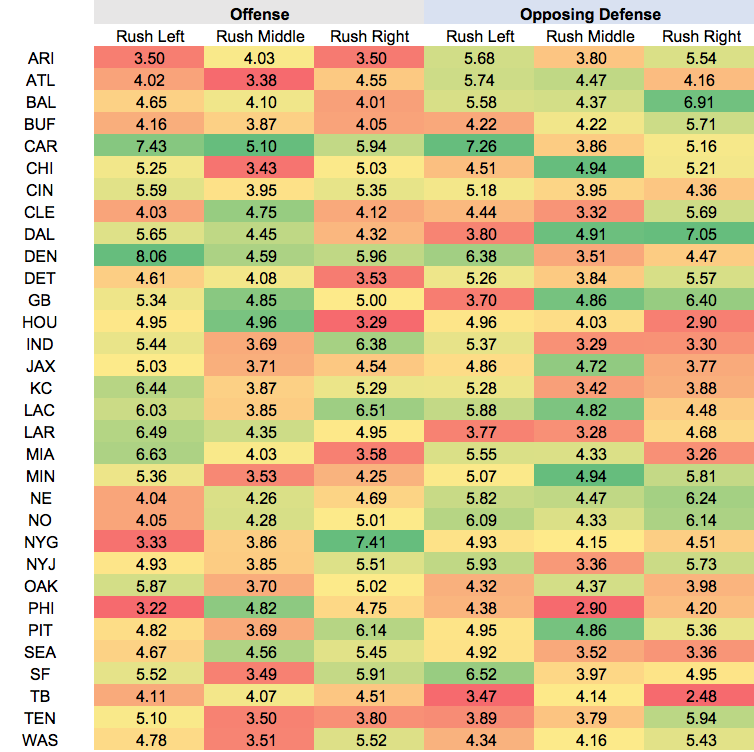 Success Rate has Chicago as the top-ranked defense, and on a per-rush basis, only three teams have been more efficient at stopping the run. You can't leave Gurley on your bench, of course, but like Adam Thielen above, he's someone who you may need to downgrade slightly this week. And by downgrade, I mean "he's not the obvious top running back play." Let's talk about this Chiefs backfield. Without Kareem Hunt, Spencer Ware played 69% of the team's snaps and handled about 47% of the team's rushes. The snap rate wasn't horrendous, but KC was giving Hunt a 68% rushing share. That's a little worrisome, especially with the signing of Charcandrick West this week. Ware is still the guy you want in the backfield, but he's also rushed to a sub-30% Success Rate this year, which is far below average. Let's not pretend he's got this role locked up. Chris Thompson returned in Week 14, and in a negative game script, he played over 64% of the team's snaps. He's not someone you can really trust in fantasy, but he's going to hurt Adrian Peterson's value -- Peterson saw his lowest snap rate since Week 5 on Monday night. With Mark Sanchez under center and an offensive line that's got issues, it's a backfield -- and offense, really -- that you should be avoiding. Dalvin Cook has carried the ball either 9 or 10 times in his four games since returning from injury, but he's yet to find the end zone on the ground. Part of that is because he's had just one goal-line rush all season long. It doesn't help that Minnesota is the third-most pass-heavy team within their opponent's five-yard line this year, but it's making Cook tough to trust in non-PPR formats. In PPR leagues, he's fine enough, having seen 20 targets over the last four games. And this week, he'll face Seattle, a team that's seen 23.3% of their receiving yards allowed go to running backs. That's the second-highest rate in the league. For whatever reason, the Packers decided that they wanted a split backfield against in Week 13. After seeing snap rates of at least 74% from Weeks 10 to 12, Aaron Jones played 51.3% of Green Bay's snaps this past Sunday, carrying the ball just 11 times. Jamaal Williams had seven carries, when he had totaled five attempts across the three games prior to Sunday. Why did this happen? Only Mike McCarthy knows. Fortunately, a coaching change could make Jones -- the objectively better runner between the two -- super relevant once again. In a plus matchup, Courtland Sutton caught more than three passes in a game this season. He found the end zone against Cincinnati, too, which was a big plus, and his seven Week 13 targets were a season (and career) high. The Broncos have a pretty favorable schedule for the passing offense through Week 16, so Sutton could work as a flex option in 12-plus team formats. Since Golden Tate joined the Eagles, Alshon Jeffery has a 14.5% target share in the Philly offense. In Jeffery's five other games prior -- the other five he's played this year -- his target share was 23.4%. This more than likely isn't a simple coincidence: Jeffery's value has dipped dramatically with the extra piece in the offense. You can't really trust him right now in your fantasy lineup. 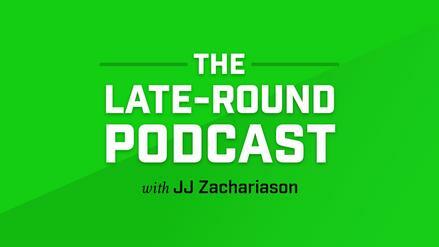 At the beginning of the season, I touted Tyler Lockett as someone to buy in fantasy football. So don't think I'm hating when I say this: Those of you who have Tyler Lockett in fantasy football are lucky as hell. Lockett's now scored in all but three games this year, giving him a touchdown on every 4.9 receptions. The league average at wide receiver this year is a touchdown on every 11.6 receptions. He's seen more than five targets just once since Doug Baldwin returned to the lineup. As reliable as he appears to be -- he just keeps finding the end zone -- he's kind of not. Ricky Seals-Jones wasn't doing a whole lot with his high target share earlier in the season, but that share has taken a hit of late, as he's seen just eight targets over his last three games. He's not playing as much, and he can safely be dropped in the deeper leagues where he's still rostered. C.J. Uzomah has 19 targets over his last two games, but he's had fewer than 40 yards receiving in both contests. According to Pro Football Focus, no tight end has run more routes than Uzomah over the last two weeks. So his peripherals are there to have a big outing, but the situation continues to not be ideal given the backup quarterback who's under center. Without O.J. 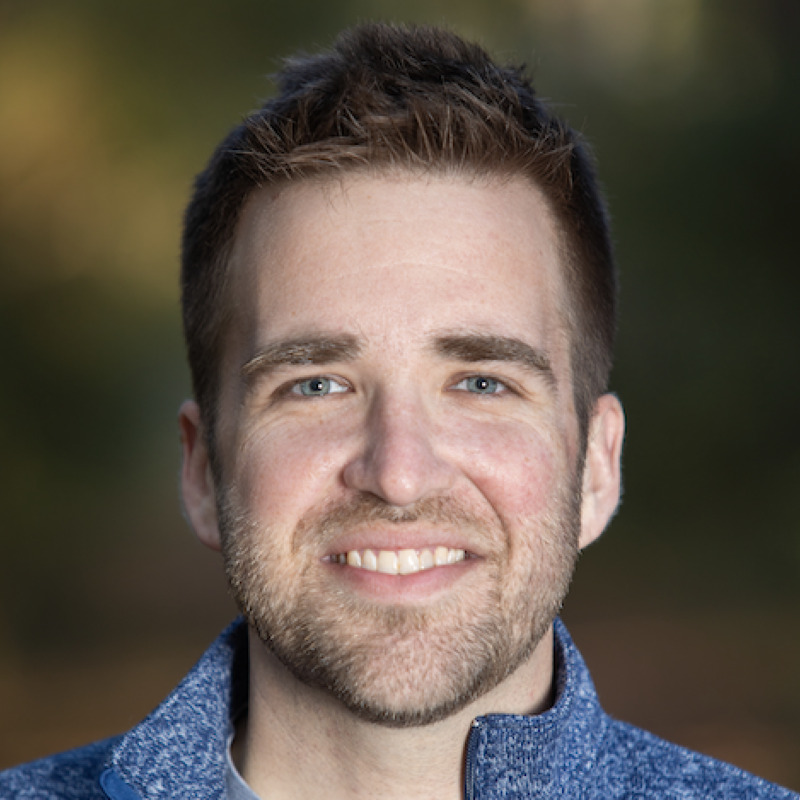 Howard over the last two weeks, Cameron Brate has 10 targets, accounting for 14.7% of the Bucs' pass attempts. That's totally average, but he's top-six in the league in routes run, which means he's at least providing the potential for more volume. It's not time to panic by any means, especially at the horrendous tight end position. As I noted earlier, Baltimore's been incredible run-heavy with Lamar Jackson at quarterback. They've also been very conservative when he's dropped back to pass. Just 13% of his throws are traveling 15 or more air yards, which is a higher rate than only Nick Mullens. This is just another reason Baltimore pass-catchers are ruined in fantasy football with Jackson under center, especially John Brown, who's a deep-ball specialist. Josh Allen continues to set the pace in deep-ball rate, and his percentage of passes going deep increased pretty dramatically in Week 13, as he tossed it 15-plus air yards on 14 of his 33 attempts (42.2%). His ability in real football will keep getting questioned, but in fantasy, he's pretty damn fun. Regression analysis doesn't always have to be so complicated. As you'd expect, there's a decent correlation between yards gained and touchdowns scored. The regression analysis in The Report looks at running back and wide receiver yards gained, shows how many touchdowns they've scored, and then finds how many touchdowns they should have scored based on trends from the last seven NFL seasons. We've got a similar story with the running back touchdown regression chart this week. One player who's intriguing is Lamar Miller, who's now scored just three times via the rush despite his 876 yards on the ground. He doesn't have a ton of goal-line attempts (6), but that number should almost be double what it is given his yardage accumulation. The Texans have two strong matchups upcoming for him, so perhaps we see a little positive regression. Brandin Cooks has found the end zone just three times on over 1,000 yards receiving. And you can't say it's just because he's a deep-ball player who's not utilized in the red zone. He has 13 red-zone targets this year, ranking 14th among wideouts, and his six targets from within the 10 have him tied in the top-15 as well. Hopefully he gets luckier for fantasy managers in the playoffs.